When you wedding ceremony will be over, let’s get the party started! And, what will be better than a fantastic aperitif? Maybe, only the following delicious wedding banquet! It’s time to talk about cuisine. First of all, you have to know which is the difference between banqueting and catering? 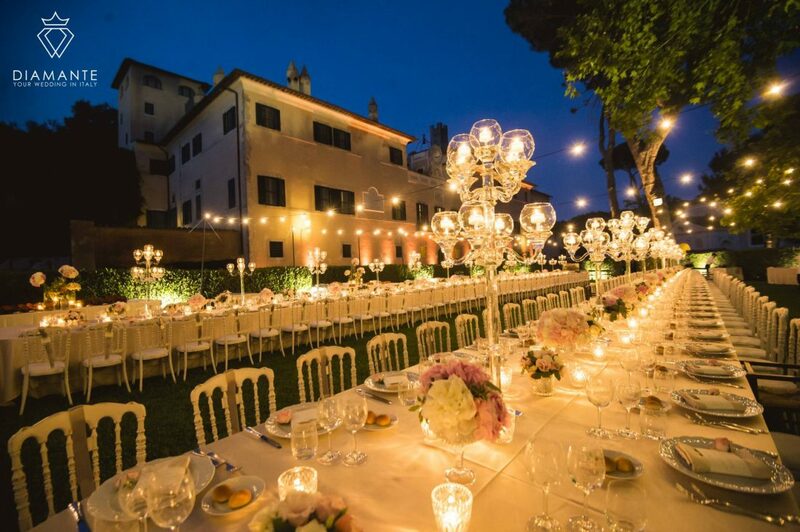 Anyway, whatever option you will choose for your wedding banquet in Italy, the result will be absolutely unforgettable. You will sit at the table you have always dreamt, after choosing among the best table cloths, cutlery, crystalware and chinaware for your event. Sumptuous banquets of excellent Italian food or a wide choice of international cuisine to suit your tastes. We will create expressly for you original menus, traditional recipes or theme dinners, butter and vegetables sculptures, ice statues or many others surprising creations. Everything according to your budgetexigencies. Italian food and beverages finesse guarantee an authentic experience, a journey among one of the most popular tradition of the world. According to Italian tradition, an authentic wedding banquet it’s made of many courses, starting from a welcome aperitif and going on with the entrees, one or two mains courses, a second course accompanied with a side dish and finally, hopefully, a sweet tooth wedding cake. But this is only the classical purpose! If you want another kind of banquet, you just have to ask! You will be accommodated in each way. Surely, the result will be extraordinary. An Italian banquet, in a wonderful Italian venue, will be absolutely the perfect gift for you and all your guests.